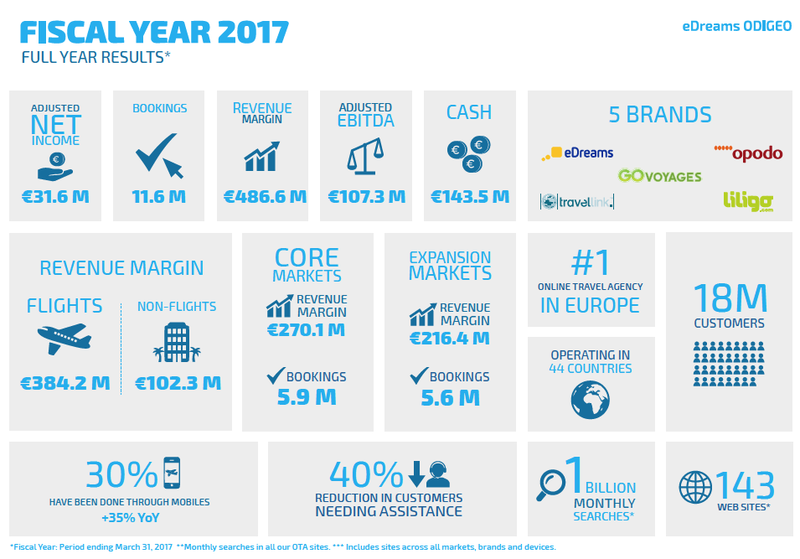 Barcelona, 27 June, 2017 – eDreams ODIGEO (www.edreamsodigeo.com), Europe’s largest online travel company and one of the largest European e-commerce businesses, today reported its results for the twelve months ended March 31st 2017. Net Income grew by 57% to €31.6 million on an adjusted basis. Industry-leading development capability: More than 1,000 product releases launched, development times reduced by 70%, and cost per release reduced by 84%. Accelerated performance in Mobile: Bookings up 35% in 2017, now representing 30% of total flight bookings. Guidance for FY 2018: Despite expected weakness in the first half of FY18, we expect Bookings in excess of 11.7 million, Revenue margin in excess of €487 million and Adjusted EBITDA of €115 million +/- €2 million (7% growth year-on-year). “These strong results underscore the excellent improvements we have made to the business. Our diversification into new products in both the flight and non-flight categories, including preferred seating, baggage, dynamic packages, car hire and hotels, contributed significantly to the strong growth in bookings and revenue margin this year and our acquisition of budgetplaces.com will enable us to accelerate the growth of our dynamic packages business. The strategic initiatives we’ve implemented and investments we’ve made over the past two years have allowed us to lead the industry on mobile, faster product releases, lower costs per booking and most importantly, more satisfied customers. As a result it has enabled us to be Europe’s leading online travel company, helping millions of customers find and book the best value and most convenient travel, in the most convenient way. Looking ahead we will continue to grow market share by diversifying our revenue streams, assessing pricing structures, increasing repeat bookings and aim to become the one-stop-shop for travel“. eDreams ODIGEO delivered a solid financial performance in fiscal year 2017, exceeding all its initial and raised guidance given to the market in June 2016 and February 2017, respectively. The strategy continues to drive improvements in the business, and is delivering positive growth rates in bookings and revenue margin, up 9% and 5% respectively. Adjusted EBITDA growth rates continue to be very strong, growing by 12% in FY 2017 as a result of growth in bookings and revenue margin combined with an 8% reduction in variable cost per booking. Our revenue diversification strategy continues to have a positive impact on our business, with growth in our flight related ancillaries and non-flight products, despite being offset by the sale of the corporate travel and packaged tours businesses. Bookings in non-flight businesses were up 3%, and up 6% excluding the impact of the sale of our corporate travel business. Revenue margin in non-flight businesses was up 7% due to increases in revenue margin per booking in our hotels, cars and dynamic packages, and offset by a decrease in our packaged tours business and its sale in France, as well as the sale of the corporate travel business. In our flight business, good progress in delivering our strategic initiatives has boosted performance and is positioning us well for long term growth. We continue to make the planned investments in our business to build scale, become more agile, improve the business model, and create a better customer experience. Our Core markets performed strongly with Bookings up 11% and revenue margin up 6%, driven by strategic initiatives, our diversification strategy and our continued investment. The FY 2017 also saw strong profit growth. Adjusted net income was up significantly to €31.6 million, representing a 57% increase year-on-year. The company continues to successfully deleverage its business; Net Leverage Ratio was down from 3.43x in March 2016 to 2.66x in March 2017. In October 2016, the group also successfully refinanced all its debt, with a full repayment of 2018 Notes and 2019 Notes, and the issuance of 2021 Notes. It increased the Super Senior Revolver Credit Facility from €130 million to €147 million, and switched its new debt to a single maintenance covenant of 6.0x Gross Leverage Ratio, with the terms also improving to allow for efficient repurchases of up to 10% of principal per year. We have successfully reduced our covenant ratio from 5.0x in March 2016 to 4.0x in March 2017, which gives us ample headroom vs our Gross Leverage covenant ratio. In the fiscal year 2017 the group reported a very solid cash flow performance with a cash position of €143.5 million (up 9% year-on-year), despite cash outflows of €52.7 million related to the repurchase of 2018 notes and the bond call premium and other refinancing flows related to the refinancing of 2018 and 2019 bonds . Cash flow from operations went from 82.0 million euros to €134.1 million, and Cash Flow before financing from 51.5 million euros to €104.6 million, as a result of improvements in EBITDA and working capital. Overall the Group delivered a very strong cash flow performance. The financial performance for the fiscal year 2017 demonstrates that the shift in our business model is delivering positive results. We continue to drive more revenues outside of flight tickets which are higher margin and generate more cash for the business. Overall we consider this a solid set of results and above our initial and raised guidance, and in line with where we would expect to be following the start of our transformation in June 2015. Our Core markets (France, Italy, Spain) delivered a solid growth in bookings and revenue margin in fiscal year 2017. Core markets bookings reached 6.0 million, up 11% year-on-year, as a result of our diversification strategy, the investments made on our business to build scale, become more agile, improve business model, and create better customer experience, and partially offset as a result of the sale of the packaged tours business in Q3 FY 2017. Revenue margin in our Core segment for fiscal year 2017 also experienced solid growth rates, up 6% year-on-year, to €270.2 million. While revenue margin per booking fell 5%, the group delivered 6% growth in revenue margin as a result of our continued investment in the business. Expansion markets experienced solid growth rates in bookings, up 7% year-on-year, in the fiscal year 2017, driven by investments made in our business and revenue diversification, growth in bookings was partially offset as a result of the sale of the corporate travel business in Q3 FY 2017. Expansion markets revenue margin was up 4% year-on-year for FY 2017 to €216.4 million. The performance was driven by booking growth, negative foreign exchange impact, in particular the depreciation of the pound vs the euro, and revenue margin per booking. Progress in strategic initiatives has boosted our performance and positioned us well for longer term growth. In fiscal year 2017 we delivered solid growth rates in flight bookings, up 10% year-on-year. We continue to make investments in order to build scale, become more agile, improve the business model, and create a better customer experience. Revenue margin performance in our flight business experienced growth rates of 5%, reaching €384.2 million for fiscal year 2017. Revenue margin growth was driven by growth in bookings, which were up 10% year-on-year. Revenue Margin per Booking for flight products was down 5%, as a result of longer-term investment in customer value, the shift in our revenue model, which includes increased price transparency display in some countries, and the negative impact of the foreign exchange, already explained. This negative impact was partially offset by the positive impact from our revenue diversification strategy, which included flight related ancillaries, which delivered solid results, up 31% year-on-year. Non-flight business bookings were in particular affected by the sale of the corporate travel and packaged tour businesses. Non-flight bookings were up 3% in the FY 2017, excluding the impact of the sale of the corporate travel business growth in bookings would have been 6% in the FY 2017. Non-flight revenue margin growth was driven by the revenue diversification strategy. The growth was primarily as a result of an increase in revenue margin per booking, driven by solid growth in car rentals, hotels and dynamic packages. Revenue growth was partly offset due to the decline in packaged tours as well as the sale of the corporate travel and of the packaged tours businesses. 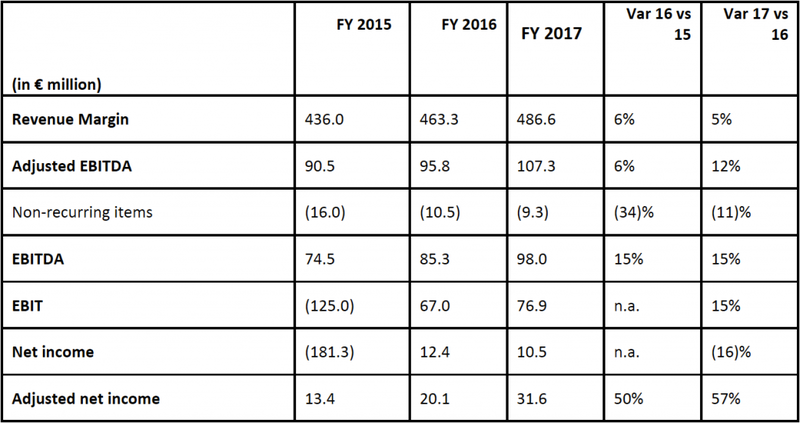 For the FY 2017 these businesses grew revenue margin by 7%. Overall, we made good progress on all our strategic initiatives in the fiscal year 2017. With regard to traffic source, we successfully shifted the mix to less expensive traffic sources. We have been focusing on lower cost channels and customer retention. In addition, improvements made to our products have helped. This is reflected in the 9% bookings growth while reducing our variable cost per booking by 8%. In addition, our acquisition cost per booking was reduced by 22pp since Q4 FY 15. Mobile channel bookings continued to improve, up 35% in 2017 fiscal year, representing 30% of our total flight bookings on average in Q4 fiscal year 2017. Mobile app downloads also continue to increase, up 74% year-on-year. Customer satisfaction results have increased significantly, with a 40% reduction in customers needing assistance, due to a 400% increase in Self Service Help Centre visits, resulting in a 10% reduction in contact rate. In addition, our resolution rate also improved, up 15% year-on-year. All our product teams are already integrated in the new agile product development methodology. This allows us to deliver product development much faster, with a significant number of new functionalities launched both in mobile and desktop. In FY 2017, more than 1,000 product releases were launched, which is 3 times more releases than the same period last year, development times were reduced by 70%, which resulted in 15 minutes best case delivery time from development to code live, and it reduces by 84% the cost per release. Furthermore, we have also been successful in revenue diversification with value-add products that increase customers’ basket size, by increasing our revenue diversification ratio from 27% in Q4 FY 2016 to 30% in Q4 FY 2017, the product diversification ratio also increased from 39% in FY 2016 to 45% in FY 2017, and our ancillary revenues, which includes flight related ancillaries, also increased revenue margin by 31% year-on-year. We will control the transformation pace to continue to grow absolute Adjusted EBITDA. All of the above is fully reflected in our guidance for full-year Adjusted EBITDA of around €115 million, up about 7%. eDreams ODIGEO is one of the world’s largest online travel companies and one of the largest European e-commerce businesses. Under its four leading online travel agency brands – eDreams, GO Voyages, Opodo, Travellink, and the metasearch engine Liligo – it offers the best deals in regular flights, low-cost airlines, hotels, cruises, car rental, dynamic packages, holiday packages and travel insurance to make travel easier, more accessible, and better value for the more than 18 million customers it serves worldwide. With a presence in 44 markets, eDreams ODIGEO is listed in the Spanish Stock Market. This excludes certain receivables and costs that are not related to trading and are not expected to recur. The adjustment primarily related to fees for the successful refinancing of the Group’s debt. Adding back these non-recurring items, net income for the year was €31.6 million.